Sailing on the high seas aboard a Maldivian cargo vessel is the best way to see the real Maldives, writes Donna Richardson who undertook an epic adventure to the furthermost southern region of the Maldives to uncover the astounding beauty of the archipelago, in a very unconventional way. 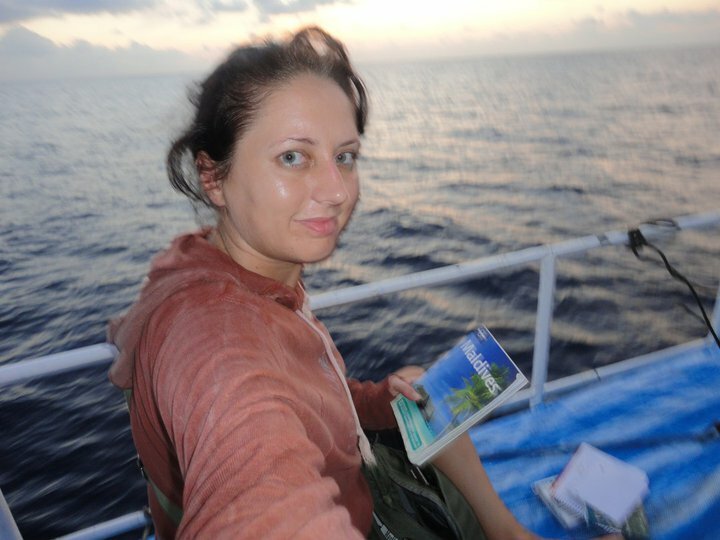 As one of the first independent travellers’ to charter a Maldivian cargo vessel, and certainly the only western woman on deck, I undertook an incredible journey across more than five atolls to escape the ‘maddening crowd’ of the capital Male. 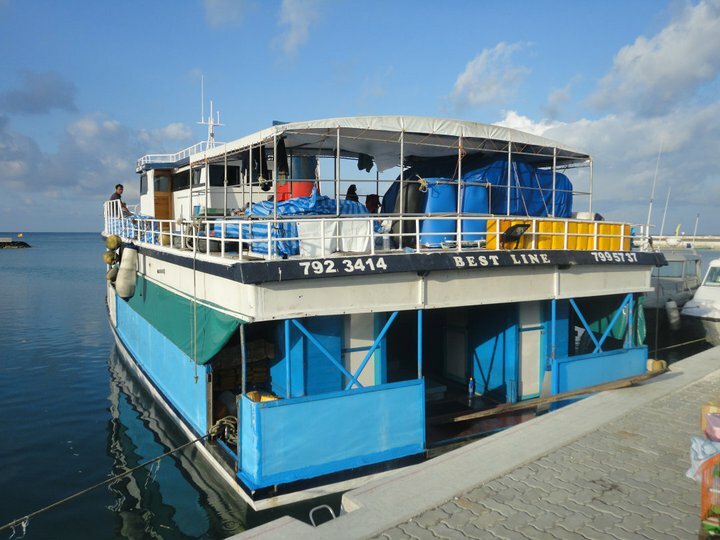 During this journey of self discovery, the vessel navigated through the pristine and unspoilt waters which make up 99 per cent of the Republic of Maldives. 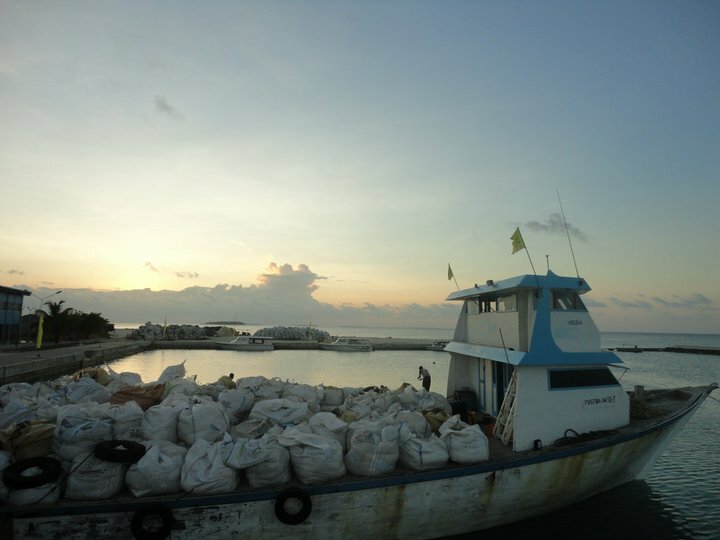 Bound for Addu Atoll, the journey would take three-and-a-half days. Along the way I made some life-long friends along the way plus learned a lot about the ‘true’ Maldives. The cargo ship trip came about quite by accident. January is always a boring month, wherever you are in the world, and as an expat forced to spend Christmas in a Muslim country while many of my friends spent the festive period at home, I could think of nothing more depressing than hanging around in Male’ waiting for things to happen on island time (without the cocktails). Fortunately, being in-between work, meant I found myself lots of time on my hands, so I decided to fulfil a dream I had harboured for months since arriving, visiting the Royal Air Force’s staging post during the Second World War – RAF Gan located in the far south of the archipelago and one of the few historical sights left in the Maldives. For tourists there is only one ‘official’ way get to Gan – a domestic flight via Maldivian airlines. Soon there will be direct flights to the south but I actually craved a real adventure. So, following the advice of a Guardian article penned by resident writer and editor of Minivan News, JJ Robinson, I made a few discreet enquiries at the docks close to the Fruit and Vegetable Market in Male and it wasn’t long before soon found a willing crew and captain to transport me to my destination of Addu. I have always wanted a collection of brown leather trunks with brightly coloured stickers from all the world’s corners. Perhaps because I am a hopeless romantic at heart, the notion of travelling by sea conjures up images of travellers in the early 1900s who spent days on the ocean in order to reach their destinations. Back then, arriving at the destination was as much a part of the trip as the destination itself. This also constituted the first ‘real’ travelling experience out of my comfort zone. I have worked and travelled in Dubai, and travelling to Europe for holidays, I have never started a journey not knowing where I would end up. So it made it all the more thrilling in a country which until recently did not even allow independent travel in one atoll, never mind across half of the country. What is more, this uniquely thrilling experience was so simple to organise and actually cost peanuts compared to organised tours. There are many safari boats which also create a similar experience without the rough edges, but expect to pay at least $2,000US compared to $36US or MRF300 per round trip. 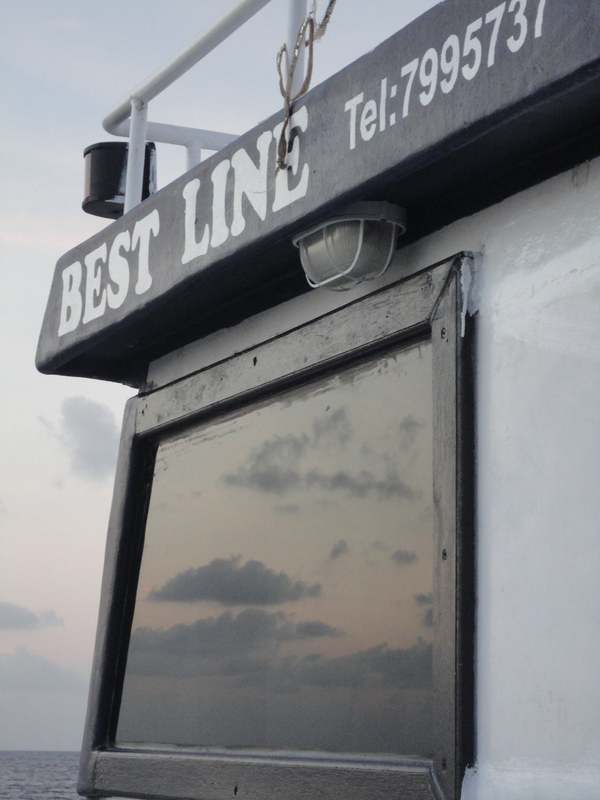 Now ship travel is not for the faint hearted, so I have to warn you that my vessel aptly named ‘Best Line’ was a rudimentary but sturdy wooden three-tiered boat, not a luxurious safari boat. Depending on sea conditions, I was told it would be a three to four day/night trip across rough seas but for less than 12 dollars a day and the chance to live an experience of a lifetime, seeing things most only dream of – or pay good money to do, it was worth the less glamorous aspects of the journey, such as there being no shower, hairdryer or creature comforts. It was not going to be pleasant but as an aspiring war correspondent I felt that it would test my mettle and prove if I could tough it out under extreme circumstances. Hence, just 12 hours later I found myself boarding the vessel with two dozen or so other Maldivian ‘stowaways’. Passengers make a nice sideline to subsidise the crew’s wages. As they are transporting the ship’s main cargo of fruit, vegetables, household goods and consumables to various locations across the Gaaf Alif and Addu Atoll, they don’t mind having a few more additions to the crew aboard. 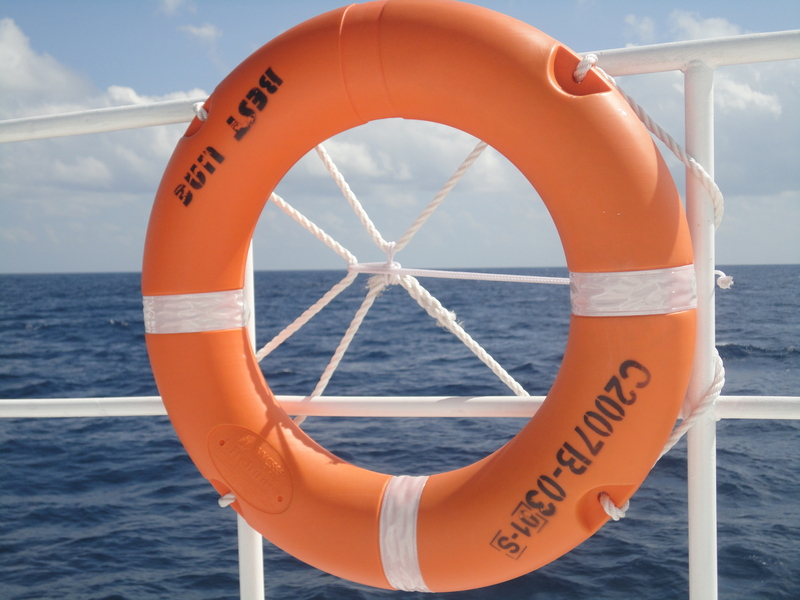 In fact the ship’s contact number is boldly displayed for this purpose as well as for suppliers to get in contact with the captain and crew. We sail by nightfall, originally scheduled to set off at midnight but delayed due to the heavy traffic on the water. The crew help me to load my luggage onto the vessel and I meet some of the other passengers. As the only westerner on board, I receive the royal treatment, given the only cabin on deck to sleep by the captain and the best china mug and dinner plate. The captain Abdul Hakeem spent 30 years working his way up to become the captain of this ship. He joined me for tea on deck. He briefs me about the journey ahead and the places we will visit and we also have a nice chat about his life and family. The engine starts up but we cannot get out of the busy port. It is choked with other vessels all vying for a launch out of Male’. The mouth of the harbour is about five vessels deep. Many of the other Maldivian passengers had already begun to settle down in various nooks and crannies around the boat, their prayer mats doubling as mattresses. 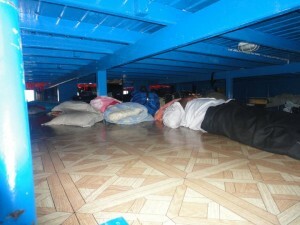 Bodies line the floor on the lower deck and the crew, including the deckhands and cooks sandwich themselves into a claustrophobic middle tier of the ship, just large enough to crawl in to, spread out your sleeping bag and to sit up. As I make my way to the top deck to the captain’s cabin, which I have use of, along with the first officer’s wife, I feel very guilty as there are around two dozen other passengers. 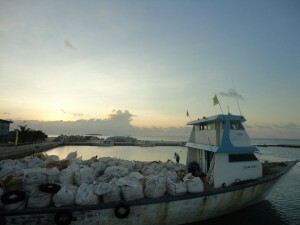 Many of whom are working in Male’ and use the boat to travel home and visit their family. For many travellers sleeping out on deck under the stars is the only option. I envy them as they have an endless canopy of stars to stare at. I’d rather swap my cabin for that experience rather than sleep in the captains’ cabin. I decide to accept the hospitality tonight but try and sleep under the stars the next night.I reach the cabin and drift off to sleep blissfully unaware that we have even left the hustle and bustle of overcrowded Male behind. (I’m told we finally left the crowded port at 3am). I wake at 5.45am just as the new dawn breaks over the Vaavu Atoll and feel an enormous relief to have left South Male behind as the sun rises out of the gleaming ocean. The first rays permeate through the blanket of dark clouds they reveal the shining glory of a new day over a boundary-less sea. With seeming infinity in any one direction, this, and the prospect of the unknown fills me with excitement. I dream and imagine the new possibilities away from the choking smog and suffocation of Male – one of the most densely populated cities in the world. As the sun rose higher into the sky, its warm rays beat down on my cool skin warming me with energy, as the cool sea sprays against my face. Below deck, I start the day with a feast of jam and bread, followed by hard boiled eggs, all washed down with a mug of hot tea laced with sugar. Vaavu atoll is vast so it takes the rest of the morning to sail through. I’m told that the first day we will sail continuously and only make our port drops the following day and on the third day we will pass through the equator and arrive at our destination by nightfall if all goes well. While many people fear cabin fever, I actually embrace the opportunity to relax, tend to my thoughts, write and read. I welcome the open ocean backdrop to help me clarify my thoughts. Naturally many of the ships’ passengers shy away from the sun under canopies and below the deck but as a sun-worshipping Brit I decide to take full advantage of the sun deck and ocean breeze as it is one of the fastest ways to tan. I find myself a prime spot at the helm of the ship and spread out my towel. I plan to while away the hours staring wistfully into the ocean and spend hours engaged in Robert Louis Stevenson’s ‘Kidnapped’ – a tale about the high seas and personal discovery. Very apt as I live my own sea dog adventure in real life. Treasure Island was my first choice but I could not get hold of it in Male book shops. 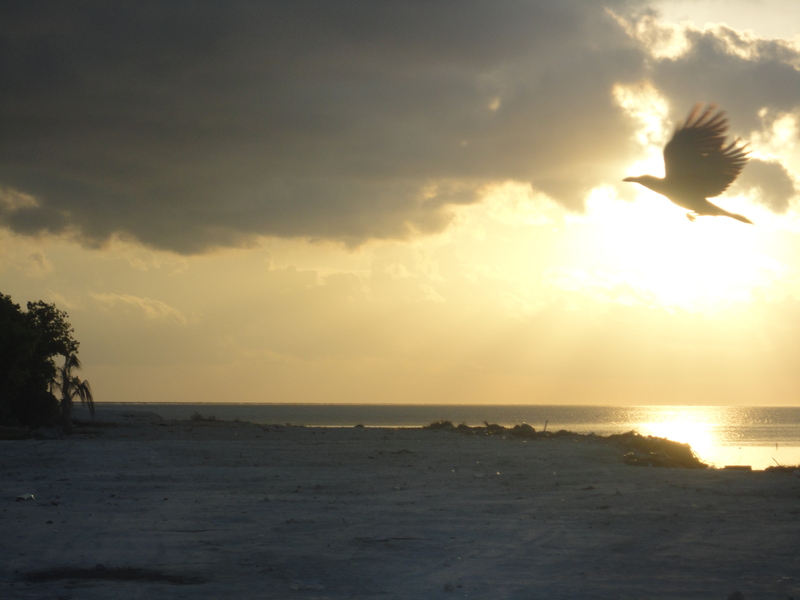 The blazing sun moves eastwards we enter Laamu atoll. This is going to be the government’s newest ‘zone’ developments. I am struck by the beauty of the islands, all uninhabited save the Six Senses resort Laamu which is due to open its doors this month. However, there is to be much change in this atoll over the coming years with the government’s new plans to extend transportation networks and extend into mid-market tourism. In fact there is talk of a three star ‘Costa Del Maldives’ of guest houses, restaurants and bars happening here to bring in hordes of backpackers and mid marketers, making the Maldives much more accessible in the near future. Laamu and its nearest neighbour, the giant Huvadhoo Atoll in the south is separated by a 90 km wide stretch of water called the Huvadoo Kandu or One and a Half Degree Channel. Because of its latitude this channel is one of the safest places for ships to pass between the atolls that make up the Maldives’ archipelago. Crossing the channel it seems that we sail for hours without a single land mass in sight. Just like the desert, the open ocean is full of wonder and mystery – I am transfixed. Sometimes mirages appear on the glistening and glimmering horizon in the form of ships and land which without rhyme or reason appears and disappears. The ocean is calm and glassy and stretches infinitely into the distance with flying fish and the occasional wave breaking the calm. I am so grateful to be away from the concrete buildings which imprison us in Male. To be out on the ocean and appreciating nature in its truest form, in a sense this is the closest to freedom I have ever been. I also feel relaxed in the ships company even though it is male dominated. Whether it is due to the Adduan gentle character, or the liberty afforded by being on the ocean away from society and watchful eyes, the people are friendlier and gentler than in the city. Spending three days at sea with a Maldivian crew aboard a cargo ship gave me the chance to live and eat with Muslims, but at no time did any member preach their religion or practice patriarchal archaic attitudes. Of course I had to be respectful of their customs and was mindful of not showing too much flesh but I felt perfectly safe and comfortable – even as much as to be able to sunbathe showing my shoulders. A stark contrast to spending most of my time in Male’ walking around avoiding the stares of clucking randy old fundamentalist Maldivian men with their menacing ‘Allos’ and stares. Whether you are religious or not, sailing on the open seas is a spiritual journey and I enjoyed the chance to get in touch with nature and the wonder of the world and its elements as a non-believer in any man-made religion. To an outsider the practice of prayer on a ship seems more relaxed, more peaceful and most of all very spiritual. I did not even notice that passengers were still observing their religion. I noticed that at sea there appears to be a more relaxed attitude towards religion with no official timing or social graces. A small mosque exists on the uppermost top of the deck in the form of a simple prayer mat is placed pointing in the direction of Mecca. However, it differs from the mainland as rather than the strict five calls to prayer per day by a baying imam, passengers were free to observe their calls to prayer discreetly. In fact as a fellow passenger I hardly even noticed the timings in the absence of the minarets. It was up to the individual when they went to pray and thus appeared to be freer and more relaxed than in Male or any inhabited islands. Out on the open sea, the curvature of the earth is more pronounced in the absence of any other landmarks. If you divide the sky into an imaginary half clock face, the time can be told by the position of the sun. Guessing the time to be around 2pm, I check and find I am not too far off as it is already 2.20pm. In the late afternoon light suddenly dolphin flipped playfully against the boat. A group of small boys ran to the bow and yelled excitedly as these beautiful intelligent creatures’ splashed in and out of the waves. I join in, delighted to share this wonderful experience with these enthusiastic children. 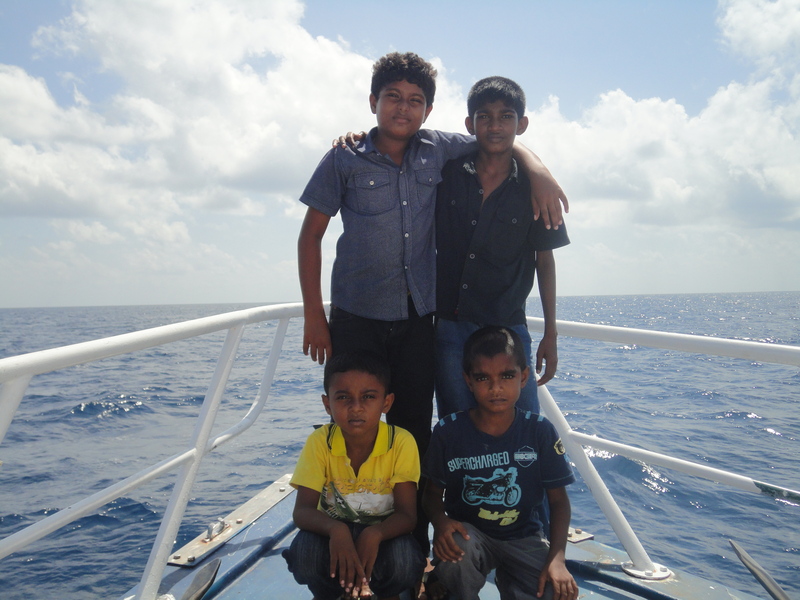 Eager to practice their English skills I soon get talking and I learn that the children are from Gaaf Alif and Gaaf Dhaal, two districts which make up the giant Huvadhoo atoll, one of the biggest atolls in the country. This is where three of our port drops will be the following day. Luckily thanks to decentralisation efforts since the changeover of government – a good education appears to be priority in the islands. As a result Shami, Shau and Libfa all speak very good English, while their elders have limited conversational skills. Nervously popping her unscarfed head above deck, a shy girl called Leufa is eager to join in the fun. Her younger brothers and she have lived in a small area above the luggage compartment for the past 24 hours she shows me. Barely 15, she is a quiet intelligent character with warm soft doe eyes which glisten wistfully as she looks over the waves and speaks about her wish to study in Singapore. She becomes animated describing her ambition to study. Suddenly she is stopped mid-flow when an older male relative throws a hijab out of her cabin and mutters something angrily in Dhivehi. Quietly and dutifully she obeys and shrouds her head, lowering it. I prompt her to continue her story. Oddly she deflects and asks if I am married, of course I say no and she seems surprised, given my age which is double hers. She explains that in the islands’ girls can expect to be married as young as 13, even though it is illegal by law. She says she does not want to marry until she has finished studying. Her fears are very real. As unemployment plagues the middle islands many men will move to Male after formal education to work, while many of the women who are not emancipated by education will be forced marry before they have even reached puberty. The isolation of these islands makes them prime breeding grounds for fundamentalism. The curse of the middle islands, as with the rest of rural Maldives is lack of education, no internet facilities and limited transportation. Being so cut off from the world makes it easier for fundamentalism and distorted values to grow. It is not uncommon for men to have concubines in the islands. Leufa’s brother Shami is an animated fellow and is very inquisitive. He points out the flying fish in the distance and tells me that in his spare time he enjoys riding his bike and fishing. He also has a collection of sea turtles in a paddling pool in his yard. In a way one of the advantages of the isolation of the islands is it helps children to enjoy fuller lives at one with nature. In the absence of video games children have a chance of having a real childhood exploring and having fun outdoors. Well male children at least. It dawns on me that these children are the future of the Maldives and their enthusiasm is infectious. 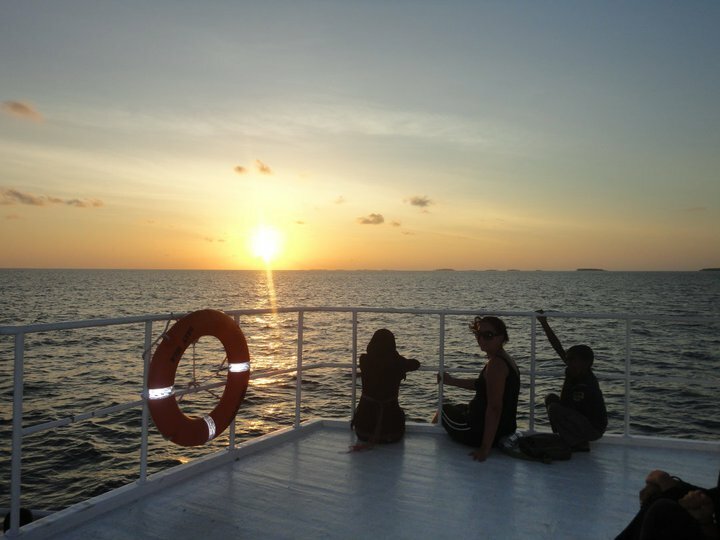 We talk and laugh as the sun lowers over the islands and dances on the waves. Despite their young ages, I already feel a strong bond with these kids. Their infectious enthusiasm has shown me that there is some hope in the Maldives. However, I am haunted by Leufa’s story and I watch her really open up and become virtually unrecognisable from the quiet, shy girl I met before as she play-fights with her brothers and they all teach me how to play a Maldivian card game. We continue playing and chatting until the sun disappears into the ocean. As the sun sets, this is the unofficial call to prayer. It is time for the children say goodbye. They have to pray, eat their supper and then prepare for bed as it is an early start for them tomorrow, when they will reach their island. As I watch them disappear I remain on deck and make a silent wish that they can enjoy childhood for as long as possible and avoid the pressures of the wahabees, poverty and globalisation. I stay like this, thinking and watching the stars and the rising moon until I am called for my supper. Below deck a supper of fish curry awaits. In the absence of shower facilities, I make do with the rudimentary facilities on offer. Brushing my teeth with a toothbrush and mineral water, the sea is a wash basin. As the canopy is lifted and the simple act of brushing my teeth as I have done thousands of times before is like the first as I am dumbstruck watching the thousands of stars twinkle in the sky above as the waves crash against the bottom of the boat below. My appetite for the star gazing has been ignited, so rather than go directly to bed, I decide to return to deck and try to sleep under the stars, offering the cabin to the weary captain who kindly gave it up. Lying on the deck watching the millions of stars twinkle in the cosmos above in the black velvet sky has to be by far one of the most amazing experiences of my life to date. With the night so clear and nothing save the occasional blinking lights of faraway vessels ahead on the horizon, Orion’s belt is luminous as we cross the equatorial channel. Someone once told me that if you stare long enough at one star a thousand more will appear in that constellation. Sure enough the glittering sky shone like millions of diamonds and with each twinkle representing a galaxy and life and infinite possibilities to our existence. One could stay for hours making out all the constellations, as I did lying on deck. Back in the days before GPS old seadogs navigated using the brightest star in the southern hemisphere and also used the positions of the constellations to navigate their vessels. The starry, starry sky forms a striking contrast against the inky black sea as the boat tips back and forth to the rhythm of the ocean. And so the lullaby of the ocean rocks me to sleep as my body becomes one with the deck. I wake at 2.30am I wake up and I am handed a coffee. It is so peaceful and the stars are so bright. I’m told at this point we are 188 degrees latitude from the equator. I stare for hours and through the eyes of the telescope I clock the firey orange Mars in the east and cool green Venus in the west. Around 4.45am the magnificent Southern Cross appeared amongst cosmic clouds, adding to the magical experience. During the three and a half days sailing, we made three port drops. Each island had its own fascinating history and charms. Overall crossing the Equatorial Channel was perhaps the worst part of this three day journey. As we crossed the channel, my seasickness reached dizzying heights. 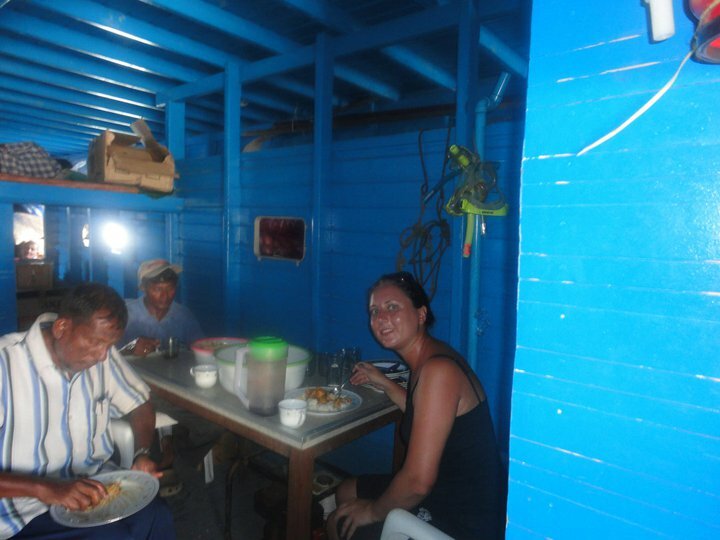 As I steadied myself on the deck and try to eat as the boat and chairs crash from one side of the boat to the other. Oh dear there goes my stomach again just remembering. The horizon tips from side to side and I try to settle for the remainder of the journey by speaking to a young recently married couple who have travelled from Gaaf Alif to Meedhu to visit her family. The husband 22 and wife, just 19, appear very much in love. They met naturally and fell head over heels after meeting in the local shop. They married within six months, they continue with me on the journey to Addu where this journey ends and my backpack adventure begins. Great article. I have travelled in one of these boats too. I am a local but it was still a unique experience for me. its a great way to experience life in the maldives without spending a lot of money for transportation.